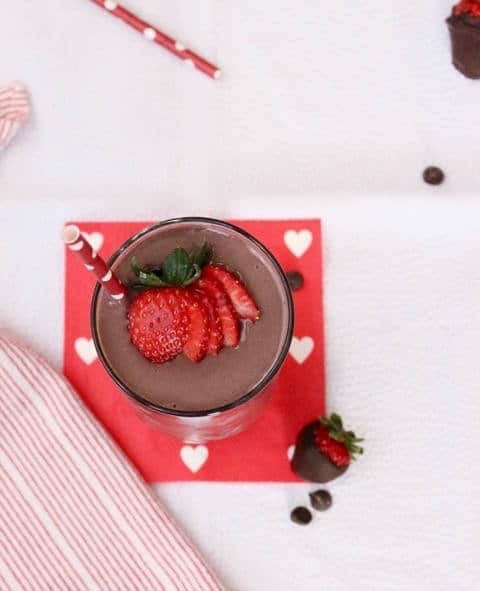 Dark chocolate, creamy greek yogurt, and sweet strawberries are the perfect combination in this frosty, heart-healthy Valentine’s Day Dark Chocolate Strawberry Smoothie! Thanks to Kaleigh McMordie for sharing her delicious Chocolate Strawberry Smoothie. Check out more of Kaleigh’s recipes at Lively Table! Raise your hand if you love chocolate covered strawberries… Are you raising your hand? 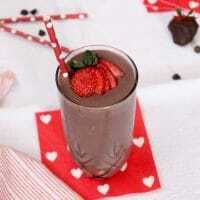 If so, you’ll love this Dark Chocolate Strawberry Smoothie! I’m definitely a believer that chocolate makes just about everything and anything better, and a healthy morning smoothie is no exception! 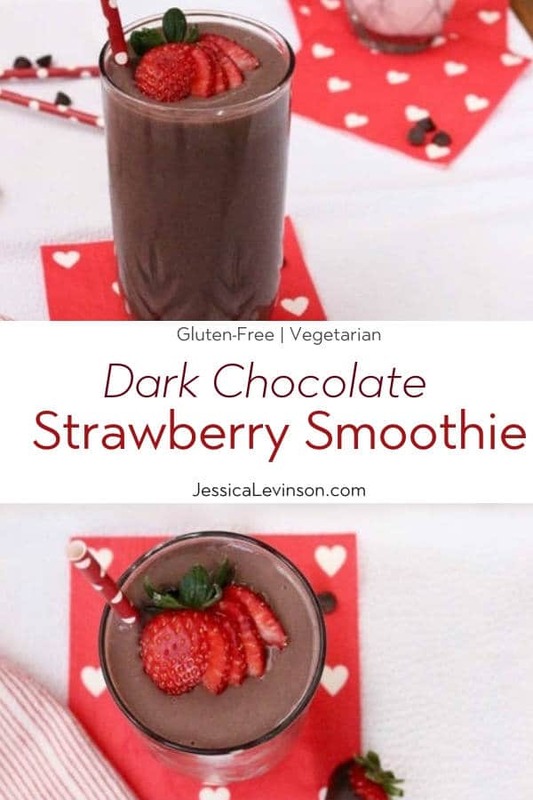 This Dark Chocolate Strawberry Smoothie is a perfect sweet treat to make for your sweetie on Valentine’s Day. It looks and tastes deceivingly decadent, but is actually made with healthy Greek yogurt, frozen berries, and delicious dark cocoa powder for a bold chocolate taste. The unsweetened dark cocoa powder contains flavonoids, which act as antioxidants in plants and can reduce inflammation without the added sugar most chocolate squares contain. So, yeah, this decadent Valentine’s Day treat is actually good for you! In the spirit of this day of love, stick two straws in this smoothie so you can share with your Valentine. After all, this recipe makes enough for two! Who knew a healthy Valentine’s Day treat could be this sweet?! When you make this smoothie, be sure to use frozen strawberries to get the thick and frosty consistency without needing to add any ice. If you only have fresh berries on hand, add about 1/2 cup of ice so that you can get the perfect thickness. If you can’t get enough of this sweet Valentine’s Day treat, head over to Lively Table for another yummy version – Kaleigh’s White Chocolate Raspberry Smoothie! 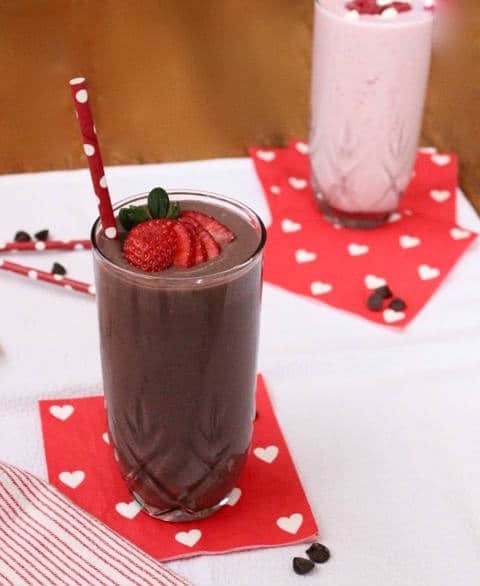 Dark chocolate, creamy greek yogurt, and sweet strawberries are the perfect combination in this frosty heart healthy Valentine's Day Dark Chocolate Strawberry Smoothie! Place all ingredients in a blender (or Bullet, food processor, etc.) and blend until smooth. Pour into a glass and top with sliced fresh strawberries, if desired. Enjoy immediately! Isn’t dark the best? Thanks for pinning & enjoy! Thanks Sonali! i definitely will be making it throughout the year! YUM, this looks right up my alley! I love those cute polka dot straws, too! Thanks Kim! Hope you try it! I think I’ll use Dark Chocolate Almond Milk…. This smoothie is totally my jam! Love it Jessica! Thanks Sara. Hope you and a special someone (or a special little sous chef!) enjoy it on February 14th! I have a similar smoothie that I loooove. But I’ve never added strawberry yogurt. Great idea! What’s in yours Lorie? Let me know if you try this one. Dessert and breakfast all in one! Definitely treating myself to this ASAP. It’s like chocolate covered strawberries in drinkable form! Exactly Jordan! Hope you enjoy! Thanks so much Whitney! Hope you give it a try soon. Definitely need this delicious smoothie! Craving all of the chocolate strawberry things right now (especially with Valentine’s day around the corner)! Hope you give it a try and satisfy those cravings asap Christine!! A classic twist on a Valentine’s Day favorite and a favorite smoothie combo. I don’t usually put yogurt in smoothies but will have to try it and adapt this one. I have a strawberry almond milk yogurt in the fridge that might be good in here. Definitely a favorite combo! I think the strawberry almond milk yogurt would be great in this – maybe it will add a bit of chocolate covered almond flavor 😉 LMK if you try it Sarah! What a great smoothie recipe! Love the chocolate in anything for breakfast! I love the way you decorated this with such a pretty strawberry AND that the smoothie is thick enough to support it! Shake-like smoothies are my favorite. YUM! Sounds delicious. Is it too late for a smoothie right now?? This is so perfect for Valentine’s Day! No matter how busy you are, you can easily whip this up and take it to go! Love it! Exactly! Quick, easy, delicious, and a healthy treat! This looks so yummy! Love the strawberry chocolate combo- you really can’t beat it. Happy Valentine’s Day! Thanks Julie! Happy Valentine’s Day to you as well! Yes, I don’t provide nutrition information for my recipes. I don’t believe in counting calories or grams of nutrients. Sorry! Can you use hershey’s cocoa? Sure, just make sure you get an unsweetened variety – there should be no sugar or source of sugar in the ingredients list.